Little is known about Laelianus. 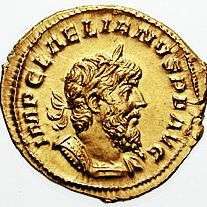 He shares the same nomen as a prominent Spanish noble family, the Ulpii, that included Trajan among its members, and may have been a relative. This is supported by the strong allusion to Hispania on an aureus he struck, which featured the design of Hispania reclining with a rabbit to her side. If he indeed was a relative, this may be the reason Spain allied itself with Claudius II, after the death of Postumus, seemingly without a struggle.